Just keep Swimming . . . .
Hello world. . . . It would seem that I can only manage one or two posts a month and if you read my last post, you will know my life turned upside down and I had a lot to get of my chest! But here we are and this is not what this blog is about! I know it's blog suicide to not keep blogging and writing but I made myself a promise, I didn't want to feel like I had to blog, I wanted to want to blog and write. And so here we are . . . finally!! If I look back on things three month ago,I felt like I had been placed in the deep end of a swimming pool and I'm not a good swimmer. (I mean i can swim but I wouldn't be in the Olympics anytime soon!) I felt like people were saying 'swim Kayleigh, swim' and whilst I floated in the deep end, under water vines had wrapped themselves around my ankles and were pulling me down. And as much as I got tired of fighting and just letting the vines take me underwater, I still had the will to fight and swim. And so I fought and slowly the vines broke away. And slowly I began to swim! I've come to realise that no matter what happens and no matter how low you feel, life does go on. There are times over the last few months where I haven't wanted to move or just sit and cry (and I cry a lot at the moment, I've become rather emotional!) And no matter how low you get or how much you think life would be so much easier if I just gave up, theres always something to live for! It's like looking for a pot of gold at the end of the rainbow, it wouldn't be there without the rain. And sometimes it takes walking through the rain to help you to see that there is something to live for. I know that when I was down, I couldn't even see a way out and everything seems impossible but sometimes the possible happens. If your like me, you worry about everything and over think things to the point to where you make yourself ill. I've found taking one day at a time easier than worrying about little things that could happen tomorrow. Instead I've decided to deal with them when it happens and concentrate on what I want to do. Those worrys will still be there and instead of having to deal with them all at once, I simply think, I'll deal with you tomorrow and carry on with your day! No need to stress yourself out or make yourself ill over something that might not ever happen! I sound like I'm such a positive person but trust me, I'm not and I can't take any of the credit. I've had the most amazing people around me to make me smile, listen to my worries or just make me a cup of tea. They've heard me cry or listen when I couldn't take it anymore or just a rant down the phone! And I know I wouldn't be swimming without any of them! For all those of you who have supported myself or my family through this hard time, I honestly thank you all! I no I couldn't have gotten through the last few months without any of you. And even though we are nowhere near the end of this painful journey, its a start. 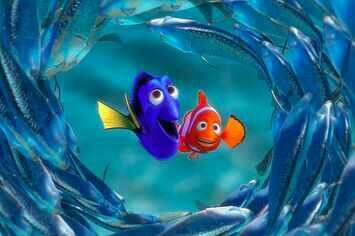 So a quote from a good old Disney film . . . .
Just keep Swimming' . . . .